At least, that’s how I imagined it went. I suppose I could have edited out the blueberry “eyes”, but they made me laugh. So of course, I left them in the picture. I adore Beth Hensperger’s recipes but loath reading long convoluted instructions. I’ve separated the recipe into steps making it easier to follow for us short attention span types. 1. Preheat the oven to 350 degrees (325 if using a dark metal pan). Grease and flour a 10-inch springform pan and set aside. 2. In a medium-large bowl, beat the cream cheese with a wooden spoon or electric mixer until creamy. Beat in the sugar, lemon juice, egg, and flour until smooth. Set aside. 1. In a small bowl, combine the flour, sugar and cinnamon. Cut in the butter with a fork or your fingers until coarse crumbs are formed. Set aside. 1. In a bowl with a wooden spoon, or in the bowl of a stand mixer, cream the butter and sugar until fluffy. Add the eggs and vanilla extract and mix well. 2. In a small bowl, combine the flour, baking powder and salt. Beat the dry ingredients into the creamed mixture in two additions, alternating with the milk. Beat until smooth and fluffy. 3. Spread the batter into the pan, building up the sides slightly. Sprinkle the surface with half of the blueberries. Pour the cream cheese mixture on top and sprinkle with the rest of the blueberries. Sprinkle the crumb topping over the top and press it gently into the cake. 4. Bake for 60 to 70 minutes until the edges are golden-brown and the crumb topping is golden. If the crumb topping doesn’t brown, broil it for a couple of minutes at the end but watch closely as it can quickly burn. Recipe from “The Best Quick Breads”, by Beth Hensperger. Picture by Laura Flowers. This is a really pretty cake, love the look of it and I would totally eat it even if it stared at me. Lovely cake! I love blueberry and this really looks delicious! I will have to try it. I wonder how vegetarians would feel about eating this now that you've anthropomorphized it. Lemon and blueberry are classically delicious together. This looks so tasty! Wow... I love all of the flavors in this. I have been on a huge lemon kick lately, so I'll definitely give this a try! I used to love long, drawn-out, precise directions, but now I prefer to just cut to the chase. Thanks for simplifying for us - this cake looks phenomenal. I keep looking at the picture of this cake hoping it will come to life on my plate. Wow! This morning I made two kinds of muffins: blueberry and lemon. I even thought about combining the two but I didn't know if the flavors would be good together...well now I know! You are so funny!! :) This looks delicious -- I love blueberry and lemon together...such a perfect pair! Those beady little blueberry eyes would be the first to go. No mercy. That cake would not last long here- it's wonderful! This cake looks decadent, dense, and downright delightful. Just the way I like it! Great recipe! This sound just plain good. Such bright flavors. 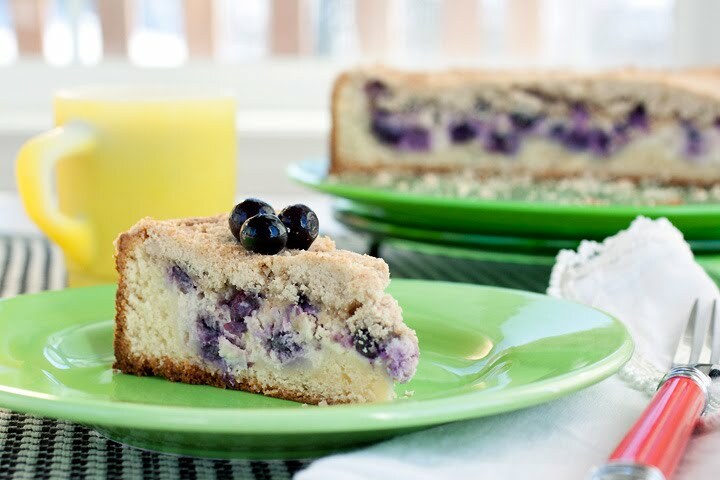 I know I would LOVE this cake because blueberries and cream cheese are some of my favorites when it comes to dessert. I know, it's sleeting here right now... is winter ever going to end?? OHhhhhhhh blueberry and lemon. It looks so good. Yum blueberries and cake! Is it summer yet?!! Hi lady! This looks so very good. I know what I'm making Saturday morning. Are you still coming to Austin? Let me know your plans :-) Thanks for sharing, sweet woman. I hope you have a great Wednesday. Happy Hump Day! The looks unreal! So Yummy! Blueberry and cream cheese are one of those combinations that I could never get tired of. What a delicious cake you've created, Laura! Let's see...a cross between a cheesecake and a cake with crumb topping, AND lemon and blueberry?!? WOW, Laura. Amazing! Hey Laura, I've been looking at your blog for a while now and I find it really interesting & fun! You have great recipes and pictures and this is one of my favorites. I would like to try this recipe and post it in my blog, and also link to your blog, are u ok with it? I'm just starting in the food blog world and you have inspired me a lot. Does this need to be refrigerated? I'd love to take it on a trip with me, would it last for a day or 2 in an air conditioned room? Thanks for the great recipe! It should be kept cold because of the cream cheese. Can you wrap it up well in plastic and stick it in a cooler? I'm glad you like the recipe.